Imagine a pond at sunrise. Now imagine that the pond is full of large fish. It’s a Florida pond, so naturally, it’s also full of alligators — about 50 or 60, at least. Now imagine that the gators are regularly leaping out of the water to grab the fish. It’s a pretty spectacular sight. Now imagine the pond surrounded with people, mostly photographers, gawking at the sight of all the gators. 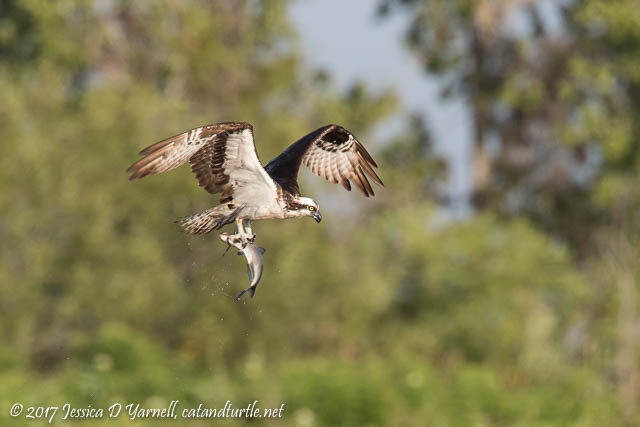 It was just another morning at the Lake Apopka Wildlife Drive pump house in late July. I’m not too fond of alligators, so I didn’t join the crowd of people shouting “oooh!” each time a gator grabbed a fish. 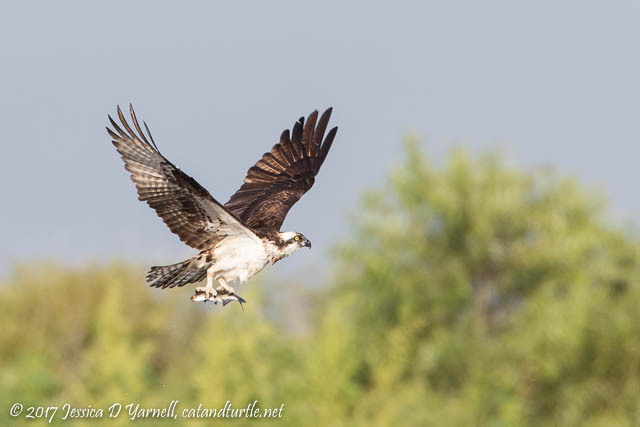 I headed for a quieter spot and focused the Beast on the skies…and the dozens of Ospreys who were also fishing in the pond. My goodness, they were pulling out some giant breakfasts! 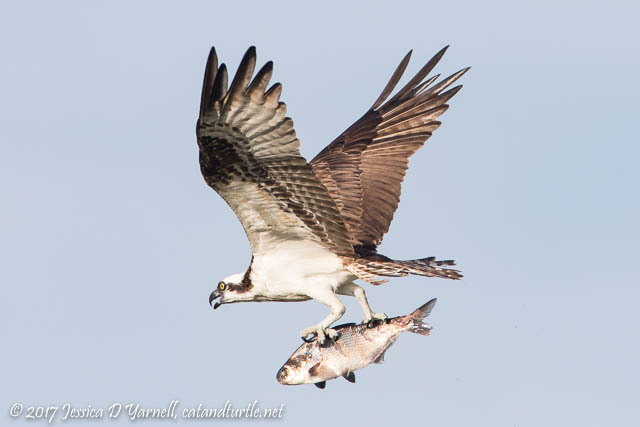 Seriously, some of the fish were almost as big as the birds! 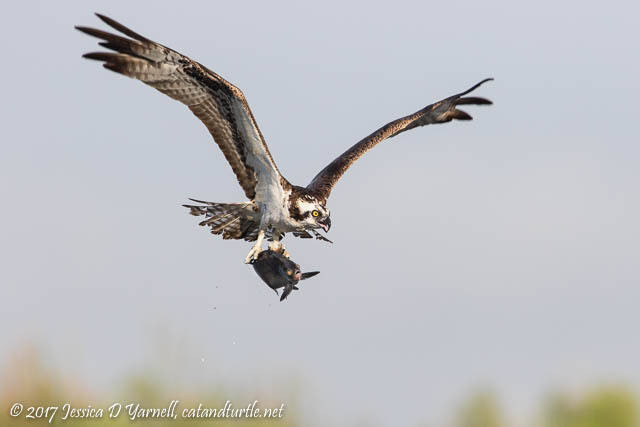 This next bird definitely needed both talons to hold on to that big fish! 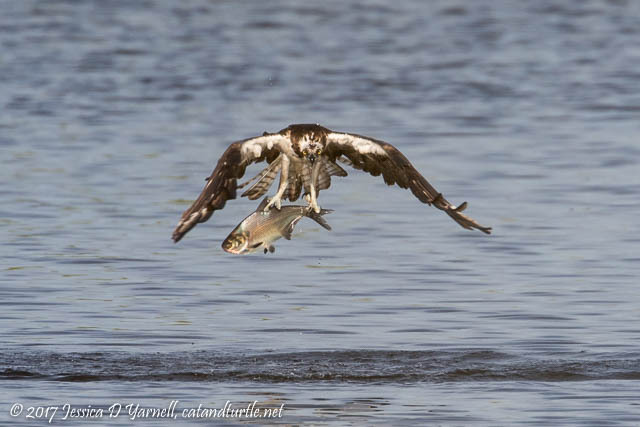 It’s challenging to capture the birds as they first pull the fish out of the water. You have to have time to pre-focus on the water near where the bird will dive, and then hope that the bird will fly towards you. 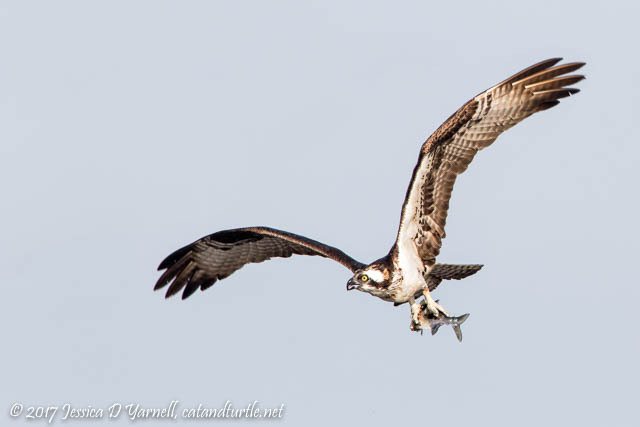 This fish was still dripping as the bird flew over the pond. The distant trees made a nice background. His fish wasn’t quite as big as his friends’ fish! Something tells me that this bird had a stomachache before he finished his breakfast. Look at the size of this fish! 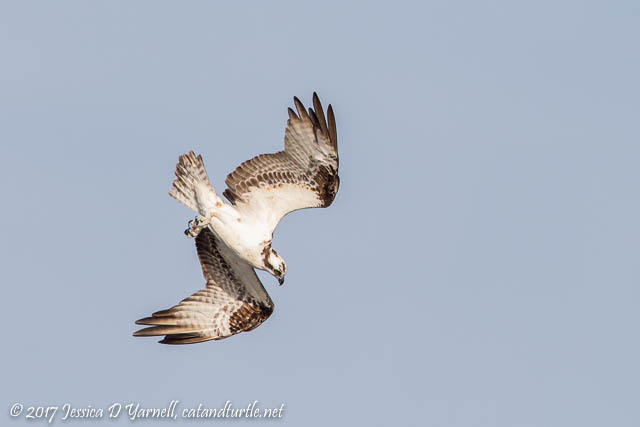 This bird was circling over the pond when he spotted a fish before. They dive very quickly. 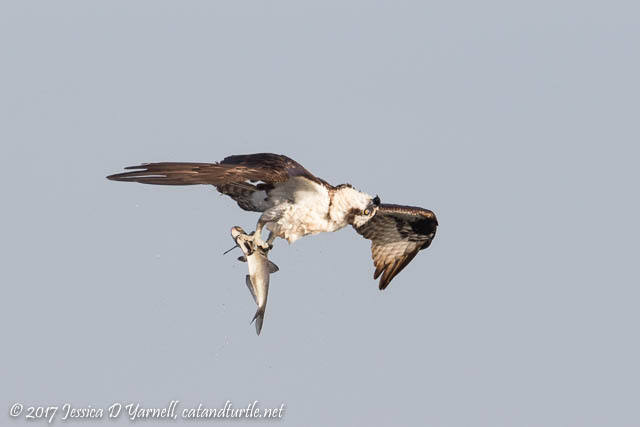 I’ve never had so many awesome opportunities for Osprey flight shots with fish. I must have photographed at least a dozen different birds that morning. Here’s a final shot with a green background. Manual exposure was a must that morning – it let me select a shutter speed fast enough to freeze the action, and expose for the bird regardless of the background. I was grinning from ear to ear when the action let up and I finally pulled myself away. Such a fun morning!